Our source of energy and life at the center of our solar system was significantly below normal with respect to activity last month. The measured sunspot number (SSN) was 18.3. That was only 36% of what is typical (51) this far into the solar cycle – calculated from the previous 23 solar cycles recorded. 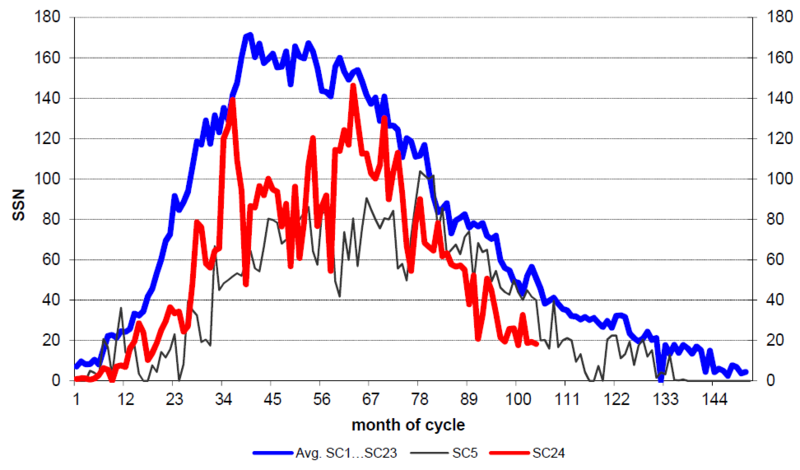 The current solar cycle 24 (red) compared to another similar solar cycle 5 (black) and the mean of the previous 23 cycles (blue). 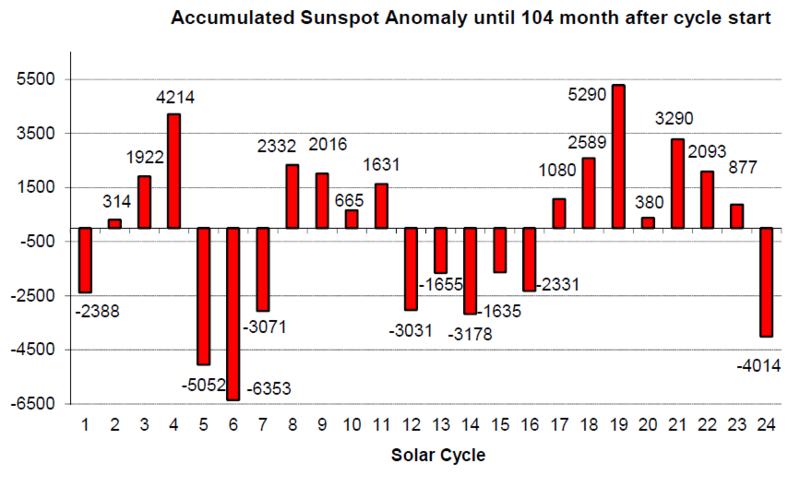 Comparison of sunspot activity of all cycles since 1755, accumulated deviation from the mean. The outlook for solar activity that is coming after the current cycle is somewhat uncertain. The error in the polar field data that has been known since May, 2017, still has yet to be corrected. Thus it is not possible to make any reliable forecasts for the strength of the upcoming cycle. One thing is certain however: the cycle will be again below normal strength. The field experiment surrounding a long inactive sun thus continues. The first chart above shows that the current cycle is the weakest since solar cycle 6, which occurred close to 200 years ago. Your diagram showing “The current solar cycle 24 (red) compared to another similar solar cycle 5 (black) and the mean of the previous 23 cycles (blue).” is interesting but as many people have pointed out, solar cycle 12 (December 1878 with a smoothed sunspot number of 2.2 and ended in March 1890) shows a better approximation to the current solar cycle. 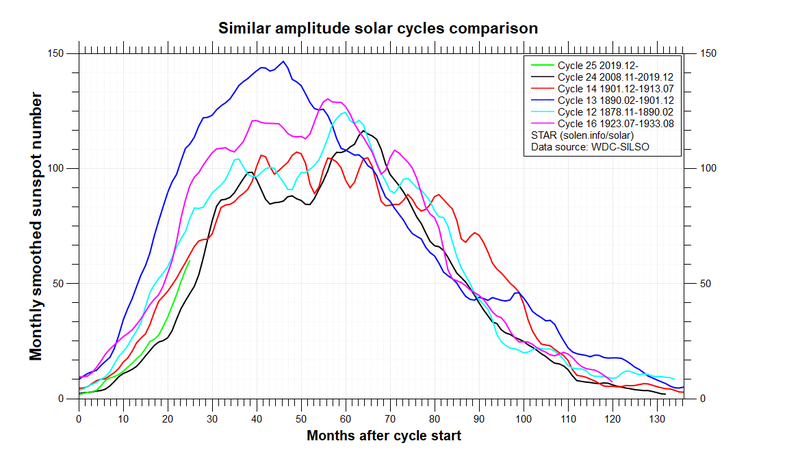 See http://www.solen.info/solar/images/comparison_similar_cycles.png where cycle 12 is cyan (pale blue/green) and the current cycle in black. Some scientific papers managed to predict its arrival and strength fairly accurately http://www.leif.org/research/Dikpati-Prediction-2005GL025221.pdf (Received 13 November 2005; revised 28 December 2005; accepted 11 January 2006; published 3 March 2006). sun is behaving in very interesting way, but an unexpected behavior. Considering that the coronal hole that has shown up over recent times has caused some upset to weather forecasting (Europe’s last winter’s stratospheric warming it caused leading to anomalous movement of the jetstream and the transient Arctic warming), maybe Dhani Herdiwijaya has a point here. The Dikpati-Prediction-2005GL025221.pdf was the inaccurate one from leif.org, saying as it does, that they expected that cycle 24 would have a larger sunspot count that cycle 23. However the Dhani Herdiwijaya stands as the remarkably accurate one. One particular difficulty: the brightness of our Sun varies on very different time scales. Some fluctuations have cycles of only a few minutes; others, which have an impact on Earth’s long-term climate, can only be recorded by researchers over decades. A unified theory encompassing all of these time scales has so far been lacking. The new study’s tour de force lies exactly in this point. I would say that while that might indeed be what happens, it is by no means “certain”. NASA is currently predicting 25 to be stronger that 24. Saying it is “certain” is speculative at best. Before 24 began, they predicted that it would be a LOT stronger than it turned out to be. And, from what I’ve seen, they have been hyping it to be bigger than it really is. ** Nope. As spectacularly wrong as they were on 24, I’m not going to trust their forecast on 25. **One e.g., early on was from a “space weather” update that gave a “sunspot number” for an accompanying photo of the sun. After clicking on the image to enlarge it, and straining to see what they were referring to, I thought I found it. Turned out to be just a speck of dust on my monitor. OH, and yest, I agree with your assessment that nothing is certain until it happens, …(and sometimes not even then). I was just bashing NASA’s forecasting ability, based on past performance. Crosspatch: From the solar polar fields one can see that they are well below the average of 1970…2016 also when one anticipates a correction after December 2016. Your comment: “NASA is currently predicting 25 to be stronger that 24.” says nothing at all about the sentence in the article:” One thing is certain however: the cycle will be again below normal strength” It’s the same as: A: “-10 is lower than 0” B:-10 is greater than -12! A cautionary note on NASA’s solar forecasting abilities. So why is it is still warming despite lower sun activity? Could it be that the small variation of solar output don’t play that much of a role to be able to override what the increase in greenhouse gases does to surface temperatures? Since the 21st century began, there has been no warming independent of the last two Super El Nino events (1997-’98, 2015-’16), which raise or lower the trend lines depending on whether we begin or end the trend with the ENSO event. 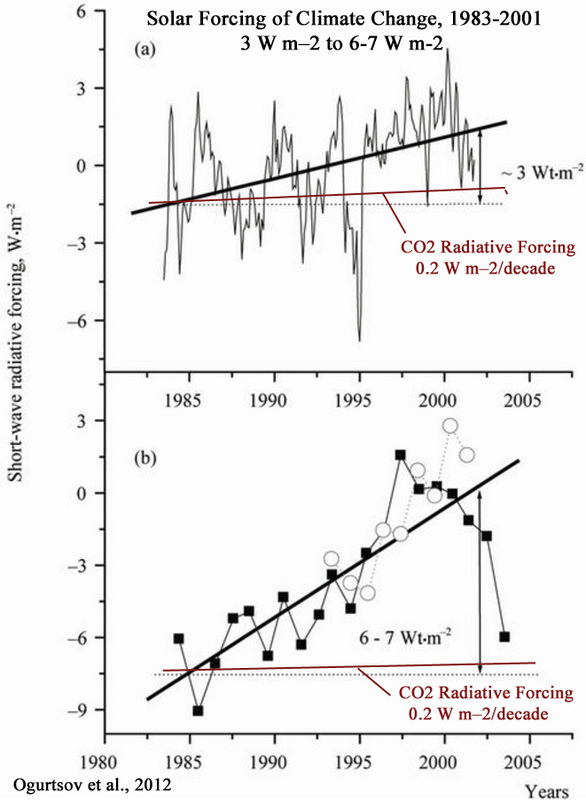 And for any warming trend that does exist in the oceans, the reduction in cloud cover since the 1980s could easily explain that, as shortwave cloud forcing completely dominates (3-7 W m-2) over any effects of small changes (0.000001) in atmospheric gas concentrations (alleged 0.2 W m-2 per decade). Yes, a few years ago, HadCRUT and RSS both showed cooling between 2001 and 2015, and UAH showed warming. From all appearances, then, any trend is conclusively statistically insignificant. I take it you have other evidence the prove your assertion? Like a statement from either of them, or their boss, to the effect that the intent of their adjustments of the UAH record is to hide the warming. If not your assertion is just a baseless smear, a slur on the reputation, credibility, and character Spencer and Christie. Or could it be that the actuality is there is no warming to hide, and that is what has so upset you. Why do you think this doesn’t apply to temperature dataset adjustments that change the trend in the other direction? Hiding the warming good, emphasizing warming bad? Skeptics choosing about the only time frame where that is the case for some temperature data series … but context is important and leaving out El Ninos as if they are not an effect of heat buildup is kind of dubious. Is that not true anymore? The cloud activity compensating for the greenhouse effect and thus causing a “hiatus”? El Ninos are connected to changes in wind, which affect vertical heat distribution. And they are natural events. Or did you think humans cause changes in tropical wind currents, in addition to being the cause of the heat content changes in the 0-2000 m layer? Do humans cause La Ninas, or are those natural? By the way, the 2010 El Nino was very strong too, which also affects the trend. Do you agree that something that oscillates shouldn’t leave the surface warmer after an event occurs? Where does the released heat come from? What do you think? And they are natural events. Natural events … the greenhouse effect is also natural. The question is, where is the energy coming from. If – as you say (by quoting) – there is no conclusive evidence that climate change influences El Ninos, then so be it. But the absence of evidence is no proof against it, is it? I’ll ask again: is what this paper (https://www.nature.com/articles/srep33315.pdf) is saying not true anymore? Have you changed your mind? You quote RealClimate on this from time to time and I always reply that you apparently aren’t understanding the fundamental difference between the 100 W/m² value and the 4 W/m². I see that is still the case. One is a 24/7 forcing value and the other is the change in LW back radiation between no clouds and cloudy sky. It doesn’t even include the blocked SW radiation that you keep mentioning. A little bit of context would be nice. Where does the released heat come from? What do you think? Vertical heat redistribution, as modulated by wind currents, which are modulated by the Sun (here and here). And ultimately, of course, the heat comes from SW surface incident solar radiation absorption. If – as you say (by quoting) – there is no conclusive evidence that climate change influences El Ninos, then so be it. But the absence of evidence is no proof against it, is it? Correct. Proof is an extremely high standard that one can only aspire to when so little empirical evidence is available. On the other hand, if we say there is no conclusive evidence that a decrease of -0.00001 (10 ppm) CO2 from the atmosphere will cause a cooling in a body of water, does that mean we should rest assured that, since there is no “proof” of this cause-effect, it is nonetheless true anyway that -10 ppm CO2 causes a measurable cooling? Should we call people “deniers” if they don’t agree that the lack of evidence for the cause-effect is immaterial? Have I changed my mind about what? That there has been no perceptible effect of anthropogenic CO2 emissions on the CO2 greenhouse effect during 1992-2014? That the influence of CO2 on greenhouse effect trends is overridden by changes in cloud cover? Because no and no. There have been more natural El Nino events than natural La Nina events in recent decades. And ultimately, of course, the heat comes from SW surface incident solar radiation absorption. Heat released during an El Nino event comes from a reservoir of heat. What do you think that reservoir is and how heat accumulates in it? Is that because the ocean is not able to get rid of all the heat as it is being absorbed? Or do you propose a different mechanism? Should we call people “deniers” if they don’t agree that the lack of evidence for the cause-effect is immaterial? You are using so much data that is based on proxies in your quotes/citations, e.g. no actual measurements. Why is it so hard for you to understand that it is good enough to know how things behave in different situations to be able to infer what happens in another situation? And you really want to compare that to the 4 W/m² (or 3.7 W/m²) value from a CO2 doubling? So by how much does the cloud cover need to increase so the 4 W/m² CO2 induced change gets compensated for? 22.2%? Did that happen or will that happen? Or in the other case (you proposing that changed cloud cover can explain the increase in temperature): how much does the cloud cover need to decrease to have the same effect as 4 W/m² of CO2 forcing? And which way is it now? Whilst discussing the UAH adjustments, perhaps Sebastian can clarify whether he finds it odd that RSS have recently adjusted their assessment to show warming where none was previously apparent? Perhaps, Sebastian has only a 1 way view of things. Can you tell us where they wrongly adjusted the data or why it sounds unreasonable to do so? John says that second best is not best. When running an not first, only second, then not improved. SebH has not explained why second best makes a warming. The reason why little energy from the sun reaching the surface of Earth can heat it up to average 15 deg C is that Earth itself has a temperature! John says that the easy explanation must be the correct one.